Review: Phoebe & Digger by Tricia Springstubb. Illustrated by Jeff Newman. Phoebe & Digger by Tricia Springstubb. Illustrated by Jeff Newman. Candlewick Press, 2013 Currently available. Face Value: This cover is striking. Phoebe is exuberant about her beloved toy, and the joy that radiates from her face made me giggle. Newman’s illustrations have a decidedly retro flair, which is charming – but the cover feels just the slightest bit dated. I don’t know that it would stand out in a crowd of other picture books published in 2013. Does it break the slate? It’s not dramatically changing the gender role dialogue, but there are traits in this book that make it a great “pre-slatebreaking” choice for young readers. Phoebe is a girl who adores her toy truck. There’s no princess narrative or delicate flower stuff happening here. Phoebe just wants to dig into some real dirt with her truck and not be bothered about it. It is striking in its simplicity. The book is not about the choice of the truck as a favorite toy, either – it’s just an accepted fact that a girl can love a truck just as much as she could love a doll. Who would we give it to? The underlying narrative of Phoebe & Digger is about Phoebe’s transition into the role of big sister. If you know any little ones who are about to become an older sibling for the first time, this is the perfect book for the parents and children to start a dialogue about what that role looks like. 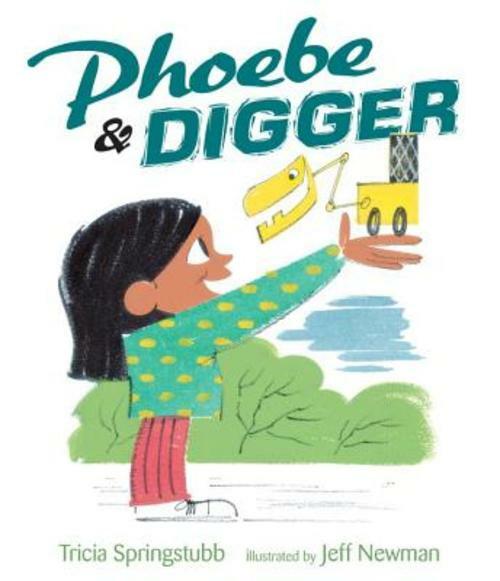 Review: I recently learned about Phoebe & Digger from the Cooperative Children’s Book Center (CCBC). The CCBC is a magical place that collects the best and the brightest children’s books and brings them together with research and critique about children’s literature. I’ve not yet had the chance to visit the CCBC, but it is on my list of things I want to do now that I live in Wisconsin. If you don’t live in Wisconsin, you can still access the amazing intellectual resources of the CCBC by subscribing to their listserv, CCBC-Net. You can sign up here. Each month there are themed discussions about children’s literature. This month’s discussion has been about “Gender Roles in Picture Books.” Ding ding ding! This conversation has been a goldmine for picture book review ideas. Author Tricia Springstubb chimed in on the listserv discussion and mentioned that her new book featured a little girl in love with her toy truck. I was intrigued, and pleased to find Phoebe & Digger already in my local library’s collection. It has all of the qualities I love in a picture book: an energetic girl character, an over-the-top dramatic plotline, and plenty of onomatopoeia. The truck noises alone make this book a perfect read-aloud choice. The clever twist of the story is that Phoebe’s obsession with her ‘digger’ is masking her dislike for the new baby that has suddenly appeared in her home. When the baby cries, Phoebe makes louder truck noises. The combination of Phoebe’s obstinacy and the baby’s fussiness drive Mama to the point when she needs to get them both out of the house. They decide to go to the park. At the park, things get interesting. Phoebe has real dirt to play with, which is heaven for truck toys. Then she encounters a bully. Sandbox drama ensues. It is entertaining to see Phoebe’s reactions play out in the illustrations as the comically evil bully snatches her toy. This is where Newman’s talent as an illustrator shines. He manages to capture the nuances of toddler emotion in each rendering of Phoebe’s face. The resolution to this sandbox saga unfortunately requires adult intervention. I would have loved to see the child characters play it out amongst themselves. It would have been very Slatebreaking to see Phoebe stand up for herself and reclaim her digger from the bully. She makes an admirable effort, but she’s not the biggest girl at the sandbox, and it doesn’t quite work. Mama steps in, and that has merit too. It offers a nice moment of family bonding as they all figure out how they fit in this new family structure. It’s not the major attention-grabber in this book, but it’s a nice feature: Phoebe and her family are people of color, and the illustrations of the others at the playground show a diverse community. I appreciate that the author and illustrator are telling a normal family story about a non-white family. This is a great book to add to any home or classroom collection, and it will expand the representation of family roles and gender roles. This entry was posted in Picture Books, Reviews and tagged childhood, Families, gender roles, Siblings, Toys. Bookmark the permalink.